"Planet of the Capes" - Part 2: "The Kids are all Fight"
We open with Jon accommodating the Teen Titans in his home after the events of last issue. Meanwhile Damien is struggling with his advanced aging, namely of the bathroom kind. The Teen Titans decide they need to go back out and find the beings that defeated them to stop them, as well as find a way to reverse Damien's condition. They ask that Jon join them, to which even Damien is in agreeance with. We cut to the mastermind behind the whole mess, a low level magician name Kraklow. He was visited upon by his future self, who gave him the means to create the beings that took down the Teen Titans. He created the trio of Atom Master, Time Commander and Faceless Hunter from clay blessed by real magic. All this is in the hopes of him becoming infamous. He sends his trio out to finish the Teen Titans, just as they burst into Kraklow's lair. A battle ensues, and the trio unleash their power onto the teenage heroes, but it appears that Jon is much more powerful than he is given credit for, and manages to turn the tide against them. The Teen Titans take care of the trio, as Robin catches up with the Time Commander, to reverse the effects of the rapid aging. The rest of the trio start to decompose back to clay, and the team apprehends Kraklow. Before the Teen Titans leave, they all have some encouraging words for Jon, and Raven tells him that he is always welcome back to the Teen Titans, even though he is not yet a teen. 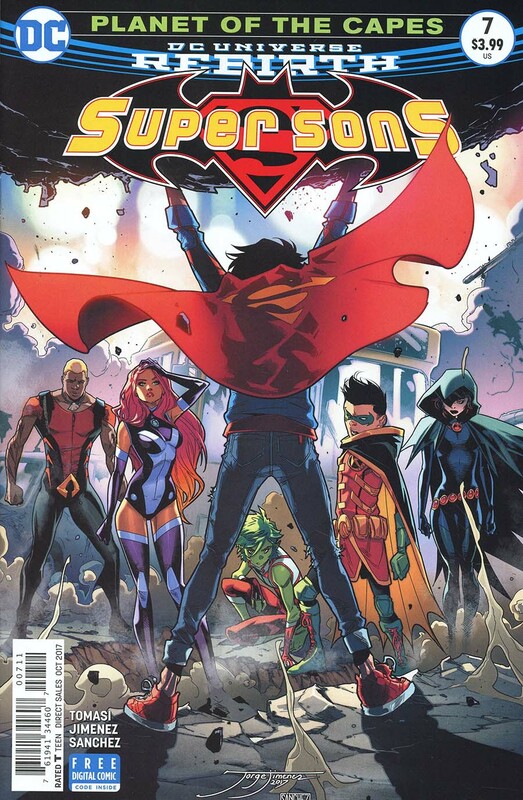 Story - 5: This was a great ending to a 2 issue arc featuring the Teen Titans. The magic of this book is that it doesn't take itself too seriously, and the light heartedness of it is a great balance to the dark and heavy undertones that are featured in the paternal character's books to the boys. In many ways, this book is about optimism, and through Jon's eyes, we see the good in most characters as well as trying to do the right thing, and learning from mistakes made along the way. In direct contrast to that, this book is also about the drive that one has to make sure perfection is achieved, and mistakes be far and few in between. This is what we see through Damien's point of view. So to write a book that doesn't rely on the moody and gritty trend that we are used to seeing is a welcome change every month. And I take my hat off to Mr Tomasi for achieving this every issue. There are always laugh out loud moments for me when I read an issue of this book, this issue it was Damien's bowel control, or rather lack of it. It was quite hilarious to see the son of Batman in a situation that is so unlike him. 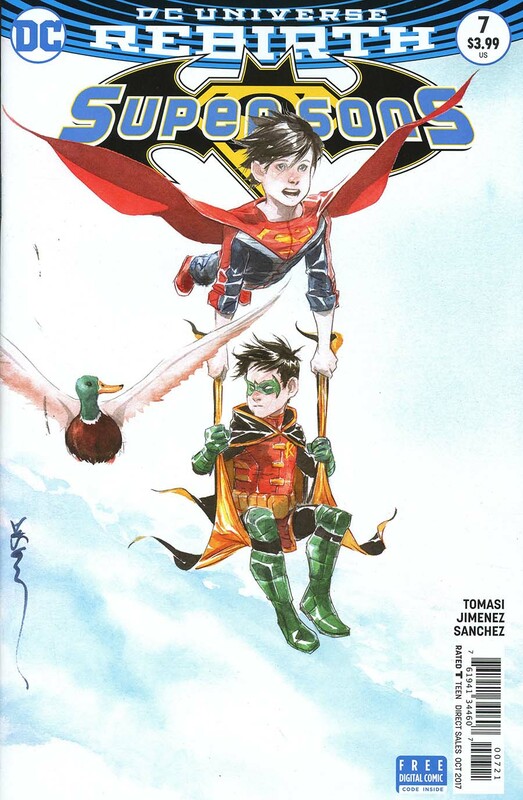 I have stated many times before that I am not the biggest Damian Wayne fan, however with what Tomasi has done with the character, and his portrayal in the DC Animated movies I've grown to dislike him a lot less. I did really like when Damien emerges after dealing with Time Commander, and he's back to his normal age. It was a nice heroic moment there that only a member of the Bat family seems to pull off with such flair. I enjoyed Tomasi's characterization of the Teen Titans. He can really capture their youthful voices in his writing, and their personalities were spot on. Even though Beast Boy has grown as a character many times through the years, they always seem to bring him back to the "hummingbird personality" as I like to call it, Tomasi writes him quite well. I'd love to see him tackle the Teen Titans one day in their regular book... Who knows, maybe by then Jon will have also joined the team?! Speaking of Jon, I purposely wanted to leave him last, so I could mention the impact he had on this issue. We see him at the opening of the issue playing host to the Teen Titans in his home. We then see him a few moments later, trying rather unsuccessfully to convince the team that he is just Damien's friend and not in fact Superboy. And finally we see that after he makes the save for the team, and once the battle is over, he is happy and honored that the Teen Titans want him to be part of the team. It also features my favorite line in the whole issue by Aqualad. "His name is Superboy right? We gotta get one of those! ", to the agreeance of Starfire. Jon's taking care of those in need, he's trying to protect his identity and he earns respect and admiration from his peers... All qualities that make Superman the greatest hero of them all... All qualities he shares with his father... All qualities that Tomasi masterfully writes into his characterization of Jon. This is why I love this book and Tomasi as a writer. I honestly can't recommend this book enough. Art - 5: What makes this book so great and a 5/5 is largely to do with the art. In the past I have "fanboy-ed" over Jorge Jimenez's art like a teenage girl at a Justin Bieber concert. That's the description my friend gave me after reading all the reviews I have written for the Homepage for this book. But I digress, and back to the topic at hand, which is Jorge's art. The man is an absolute genius at laying out a page, and capturing the tone of this book. I've said it before, the art is a perfect marriage with the writing. There are wacky comedic moments, that Jorge conveys perfectly through the facial expressions and body language of the characters, such as Robin's back and forth to the bathroom with Jon's reactions standing outside, to Beast Boys cockiness and horseplay (no pun intended), to the more serious moments, like when Jon breaks free of the Time Commanders control, to the expression on the teams faces watching Jon in action. Aside from that, I love the way Jorge differentiates the "power effects" each character has. Jon's heat vision is vastly different to Raven's magic to Starfire's power blasts. Many artists would simply not bother to try and visually make each character as unique as possible, hence why I think Jorge is miles above many of his peers in the industry today. Also, I love Jorge's Starfire. She doesn't sport the skimpy outfit from the New 52 anymore, but she still oozes sexiness. The scene of the Teen Titans busting through the warehouse door to confront Kraklow is awesome, you almost overlook the elderly Robin standing amidst the team. Aqualad looks particularly dynamic. The trio of Atom Master, Time Commander and Faceless Hunter have classic DC villains looks to them, it seems they could be plucked from the past. Jorge's art could translate magnificently to animation, and I really hope that one day Warner Animation do give it a go. I'd love to see this series as an animated show. Think of the possibilities DC!!! Jorge's art is only highlighted by Alejandro Sanchez coloring. Sanchez does such a fantastic job bringing the art to life. It's so amazing to behold. The separations and the effects make the pages come to life in a way that you need to look twice when reading the issue. Great art with great writing! Cover Art - 5: This cover doesn't give away anything that happens in the issue, yet captures the story to a "T"! Jimenez draws young people so well, and gives Jon the respect he deserves as a character without even showing us him from the front! The last time Superboy looked this incredible from a profile taken from the rear was back in 1993, when Tom Grummett introduced us to (Conner Kent) Superboy in the Reign of the Supermen storyline.